That’s Dutch for “living street” where cars, pedestrians, cyclists, and other local residents travel together without traditional safety infrastructure to guide them. That malunggay-coconut ice cream from that small roadside café in Mansasa seaside is something else. ‘Will definitely come back for another scoop or two. Yes, we stopped for ice cream. Curious Tagbilaran – Baclayon border landmarks. A hospital on Tagbilaran’s side. Baclayon’s, a funeral home. They sell bananas in sari-sari stores. Lotto outlets are spreading to the towns. They’re small. Yellow. Symptomatic. A dead snake is as scary as a live one. Even if parts of it are squashed to the ground. People are good. And kind. There’s fewer people you meet while walking. And no one really walks long distances anymore. Must be foreigners – people hunch-walking, large backpacks on their backs. Because – hey!!! – is how they greet us. Because no Bol-anon could possibly be insane enough to deliberately walk longer than 5kms at night. I could die walking at night, run over by a bus at a dark turn, and no one would know, until daylight, when my splattered brains and innards would have already adhered to the concrete road. People no longer walk. That’s why most everywhere is near, these days, basically. Duol na lang, straight ahead and inig liko sa dan, you’re there! – while encouraging – turned out to be another forty minutes of walking. But then again, distance perception declines with fatigue. Those yellow (hey there again, yellow) DPWH kilometer posts (locational reference points) are true gods’ gifts to travelers. Distance index or “feels like” kilometers matter. Back to walking, why don’t we walk anymore? Because, awto, ceres, traysikol, habal2x. Butong water is a super drink. Just the sound of running, flowing or breaking water is thirst-quenching. While we’re doing this with no pre-campaign/ pre-walk mass information activities in the towns, it actually feels nice to be randomly acknowledged. And being offered an ambulance. Lila, you have a good mayor. One can actually feel drowsy while walking. But the trash we wantonly throw around make us less so. Don’t ever stick a pain relief patch onto a sunburnt back. Ever. It’s cool that we still believe in haunted places. Like that unlit stretch of road after the Badiang Spring, the border of Valencia and reaching well into the first barrio of Garcia-Hernandez. “Ayaw laman mo pagsaba-saba dinha dapita kay tiawan na” was the warning from concerned residents. Hilom intawn pud mi galakaw. Briskly, but ever so quietly. Meanwhile, nearing the Poblacion, the liga intermission numbers are wild, wicked wild. That SinterCorp mountain is still there. Bohol’s pebble beaches are so underrated. They’re beautiful. Those piso tubig machines are lifesavers. And they’re available 24/7. Thank you! Cobra and Vita Milk are now sari-sari-store fares. Halo-halo ice candy is the new dirty ice cream. Walking in the heat is way more draining. So it’s understandable, we’re walking slower in the morning towards noon time. Pedestrian walkways in bridges are made for cat-sized people. You can tell a roadside trash has been hurled from a passing vehicle. There’s no freaking Jollibee in Duero. That’s a quite quaint roadside from Duero to Guindulman. Good for walking. You don’t realize how crazy walking 99 (or 100) kilometers is until you hear it from others. Damn. We’ve been doing this for almost three days already. Damn. How many steps, so far? Where’s a pedometer when you need one? Ok, guesstimation. We’re probably walking 70-90 steps per minute. Thus far, we’ve walked for an accumulated 24 hours (that includes rest stops). So 100,000 – 130,000 steps? Damn. There’ll always a barbeque stand at some corner somewhere. Drunk people, not so much. So many lots are for sale along the Guindulman - Anda road, why? So this is what walkers (read: zombies) must feel when they want to run so badly, you know, run after live flesh. But. They. Just. Can’t. The spirit is willing, but the flesh is weak, so goes the cliché. It’s true. And both are battling inside you. You can hear them groan and growl. While you’re trying to sing Beyonce and friends’ “Just Stand Up”. (Expletive) Easier said than done. That’s what it felt at the last 10-kilometer stretch of our walk. Where our resolve was most tested. Lots of why’s, I tell you. But when we finally reached the Kinale White Beach, our designated stop, the 99km (or 100km, what is it really?) point. Finally! I wanted to dive into the white sand and make sand angels. (Expletive.) Not quite yet. But we will. 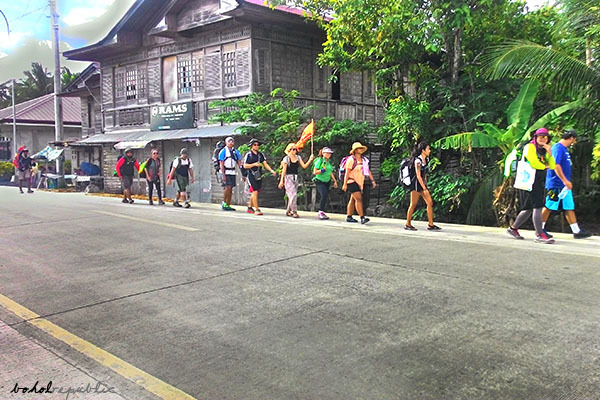 I walked 91 kilometers (yes, yes, that’s minus my Lila-Dimiao injury skip aka fast forward) for climate action, in nearly three days, that’s 144,000 steps for 100% clean energy for Bohol and the world. Imagine, what I can do from here on.